The ThumbDrive Holster from 5.11 Tactical is an ultra-secure and reliable holster optimized for tactical and law enforcement professionals. Its body is injection molded to provide a precise fit that hugs the contours of the pistol like a snug fitting glove. Once holstered, the ThumbDrive weapon lock engages to secure the firearm into place where it can only be removed by the owner. The thumb activated release trigger is strategically placed on the inside of the holster to allow for a natural draw stroke while simultaneously denying access by enemies. For added security a Chop-Block attachment further guards the pistol from combatants in the event of a weapon retention struggle. 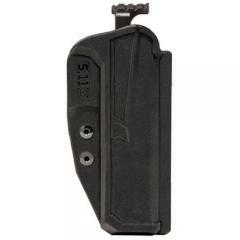 The holster includes paddle style mounts for convenient attachment and removal.